Teacher In house training program had continued. 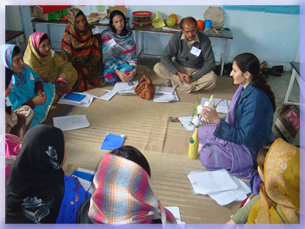 In July 2013 and December 2014 Teachers In house training was conducted to ensure their professional development and to train them cope with the existing challenging situation and to help them continue their mission with dedication. Teaching staff hold the Master’s and Bachelor’s degrees and certificates in education. We have our in-house teachers training program on regular basis to prepare teachers according to the individual needs and they have the ability to modify the basic text book curriculum and class structure. Besides in-house training, we also coordinate with different organizations to train our teachers with modern way of teaching methodologies. In this regards, in February 2010, we instigate one week teachers training program sponsored by Habib University and carried through Mountain Institute for Educational Development. Ms. Laila Dosa (Founder J.S. Academy for the deaf) Mrs. Shehla Ali (Director of Development) visited our center in June 2010 and participate in different activities with school children and with the teachers.